More than two years after it began, I can finally say that this quilt is finished. Most of that time was spent debating how I wanted to quilt this one. In the end, I kept things pretty simple by stitching in the ditch around each block and the first border before adding a simple but sort of fancy border that I can only describe as marquis. I marked the border by tracing around a kitchen pot lid that happened to be the right size with my trusty blue chaco liner. It actually worked out pretty great and created beautiful smooth curved lines that I would never have been able to manage freehand. I am especially pleased with how the border quilting worked out in the corners, creating smooth pointy bits that didn't interrupt the flow in the border. Although I was originally planning something a little fancier for the main panel in the quilt, I'm glad I kept it simple. 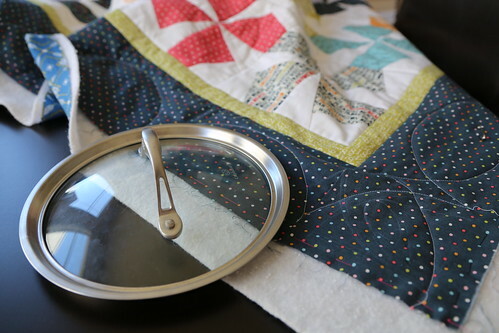 I think that the simple quilting creates a sense of calm that works perfectly with the overall feel of this quilt. 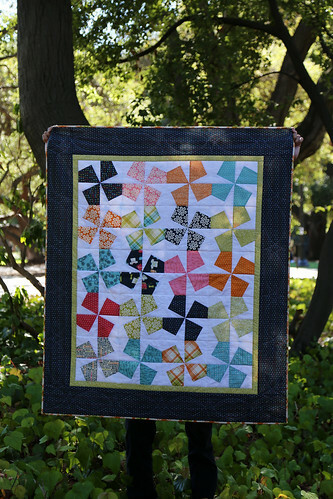 I backed the quilt using one of the clothesline prints from the same collection that I absolutely love. It was a little too narrow to get the job done so I added a leftover strip of AMH voile. It is so soft. 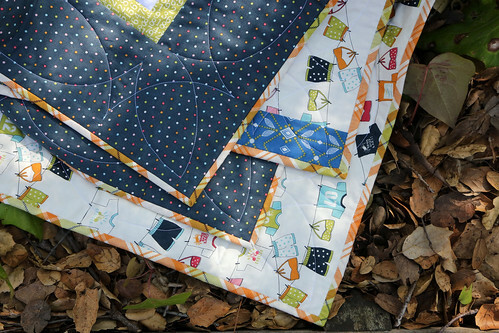 Definitely adding "back a quilt in voile" to the ol' quilty bucket list at some point. I of course bound in orange plaid since I am powerless in the face of plaid. A pretty big part of me wishes I could bind every quilt in plaid but until someone releases a collection of plaid fabric in every colour, I'm going to have to restrain myself. 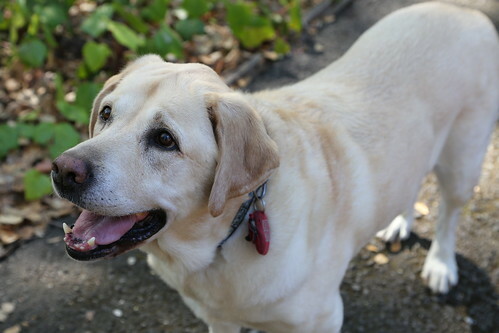 My art director came along for the photo shoot and seemed pretty pleased with how this one turned out. And with that, another baby quilt bites the metaphorical dust. Only 80-billion more to go! Happy weekend friends. Hope it's a good one! Looks great! 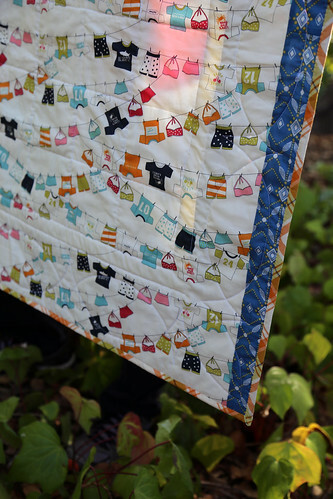 I love that quilting in the border!